Traditionally BB groups meet in the evenings in local churches. However in rural areas, some of these Companies have struggled to remain open due to small numbers of children, lack of funding and sustainable leadership. 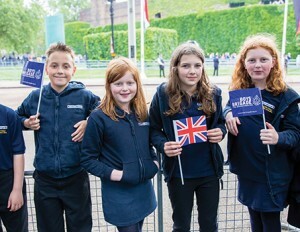 When The Boys’ Brigade and Girls’ Association agreed to partner with schools and parents in an initiative funded jointly by the Cabinet Office and Youth United, the Rural Challenge project came alive in Yorkshire and Mid/North Wales. That was in March 2015, and now over 200 children aged between 4 and 11 years have access to exciting activities outside of school hours. Each week these boys and girls can engage in the BB programme, having fun with a range of activities in the areas of Body, Mind, Spirit, Creativity and Community. Eight groups have started up since the launch; Shotton, Ruabon and Brymbo in North Wales as well as Middleton Tyas, Brompton on Swale, Catterick, Scapegoat Hill and Bolton on Swale, in North Yorkshire. Over 200 children have signed up since the first official group started in October 2015, which is amazing! That explosion of recruitment in just 9 months confirmed the obvious need in these areas. The project developed its own logo and adapted this for its own uniform, a hoodie, an item which children could easily change into straight after school. ‘Rural Challenge is brilliant! I look forward to it every week. It’s fun and challenging. Boy, aged 10, North Yorkshire. ‘This is just what my child needs and she is really looking forward to going to Rural Challenge. Rural challenge is rooted in the community and works within schools. When approached for support, the schools have been amazing, providing facilities for an hour before or after school at no cost, and actively encouraging community participation. One Head Teacher even took a leading role to get the group up and running. I would like to make the school a central hub in this community and this programme would help us start that. Although the Rural Challenge project provides employed Children’s Workers directly funded by the Cabinet Office, the groups rely substantially on volunteers recruited from local churches and parents in the community. Incredibly, there are currently 44 volunteers who make this work possible and they are the key to its success! Like all forward thinking initiatives, recruitment is ongoing to ensure the groups are sustainable. One recently recruited volunteer was an ambassador for the National Citizenship Service and after graduating, chose to help his community by investing time into the Rural Challenge project. ‘We tried running a club similar to this before and whilst it generated much interest, it was hard to maintain with limited leaders. Rural Challenge provides an opportunity for us to give this another go, but this time with the support from The Boys’ Brigade and Girls’ Association along with Youth United funding, we really can establish something special. Some children travel long distances just to get to school, so the chances of these children coming home and travelling again, to be part of a BB group, is reduced. Buses are often organised by the school so children from surrounding villages can attend groups at the end of the day. When this is not possible parents create a rota to pick up and drop off children so no one misses out. For children attending different schools there is an allocated project minibus available to ensure outreach and engagement with children and young people from an even wider area. This village has been crying out for something like Rural Challenge for years! Our children have had to travel some distance to access clubs like this in the past. I think it will be a great success! Each group has its own Chaplain, a minister from a local church. These sponsors aid with recruitment of volunteers but also have the important task of leading devotions and bible story times. This is a great opportunity to encourage local children to have fun and access the local church facilities in the longer term. A large part of the success of Rural Challenge is its ability to tap into local resource and involve the wider community. It’s good to see these new groups looking for opportunities to give back in simple ways, such as litter picks around their schools. The BB is keen to see the project grow further, expanding into even more schools and reaching a wider geographic area whilst continuing to focus on the sustainability of the project. And the obvious potential to progress and work with the over 11’s is always on the horizon. Rural Challenge has a bright future! Please continue to pray for its success and capacity to outreach to young people in rural areas.